I’m Andrea Young. 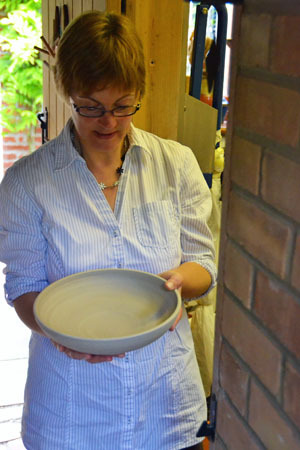 I make wheel – thrown pottery for daily life at my tiny studio in Wattlefield, Norfolk, UK. 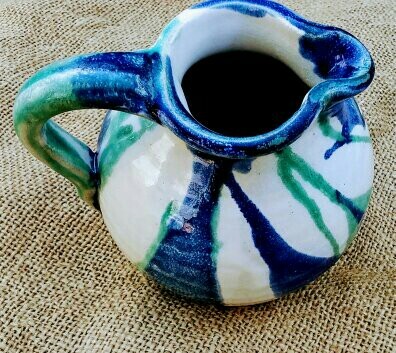 I work with stoneware clay to produce domestic items that can be enjoyed and treasured as part of daily life. Each of my pieces has their own natural dignity, individual characteristics, and charm. So that you can get to meet the creator of these pieces, I exhibit my work locally within Norfolk where I can be found at craft markets and country shows. My studio opens during Norwich and Norfolk Open Studios fortnight each year and links to these events can be found on my Events page. The studio I work in is just big enough for my wheel, kiln, and small work bench. There’s no heating or water, for the water I have an old fashioned wash stand. My pots are made, dried, and then fired for 12 hours to 1000°C in an electric kiln. 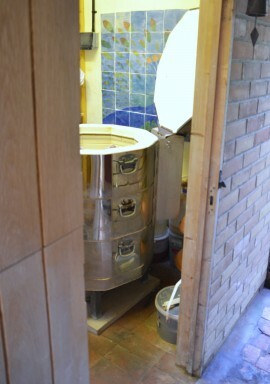 Glaze is then applied to the pots and the pots are fired once more for 12 hours but this time to 1260°C. 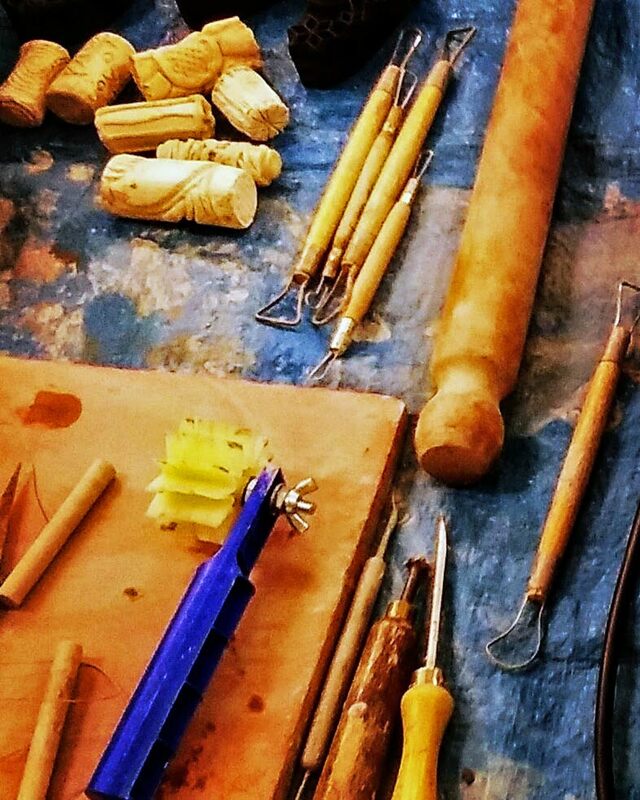 Tools for rolling, cutting, trimming, carving, incising, texturing and pattern making. Any number of possibilities for creative design are determined by the choice of tool to be used in the hands of the potter. It’s always a joy to find something special. 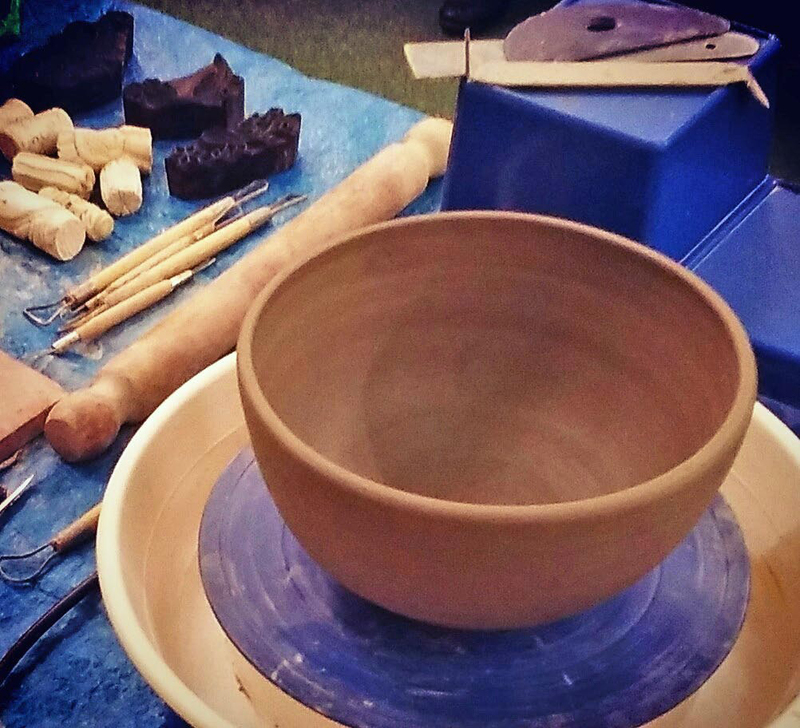 Bowl on the wheel – this was made during a talk and demonstration for a group of 30 people at their event. Andrea is available to give a talk and demonstration about her pottery to your group at your event. 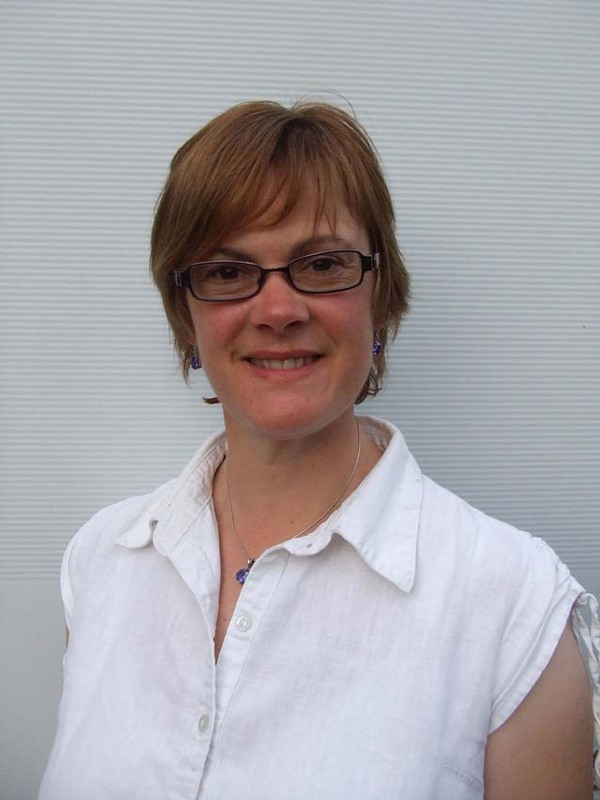 Andrea Young is available to give talks and demonstrations about wheel – thrown pottery to groups and at events in Norfolk. Norfolk WI groups have regularly enjoyed seeing pottery being made and have gained insight into the processes and decorative techniques involved with handcrafted pottery. 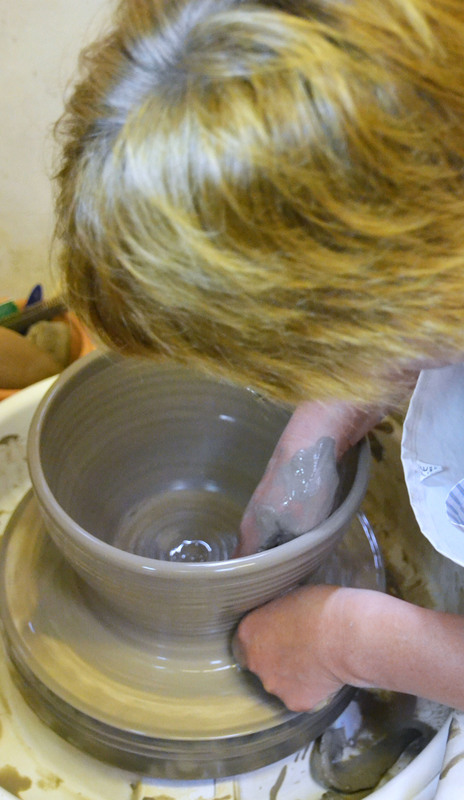 If you wish to have a speaker and demonstrator at your group meeting or event, contact Andrea at Wattlefield Pottery to discuss fees and booking arrangements. Contact Andrea Young at Wattlefield Pottery for fees and booking info for talks and demonstrations. 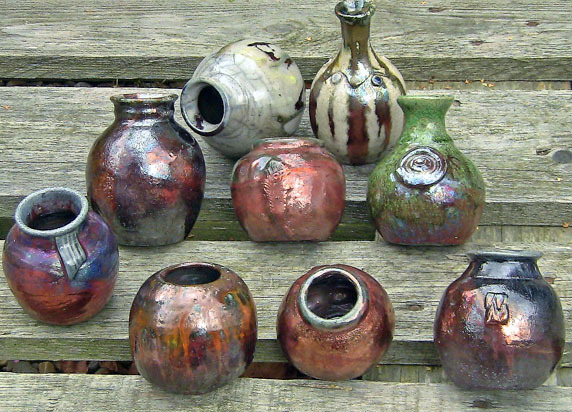 I also enjoy other processes of pottery making such as Raku. This gives me an opportunity to try something experimental and the results for raku are decorative as opposed to being functional. 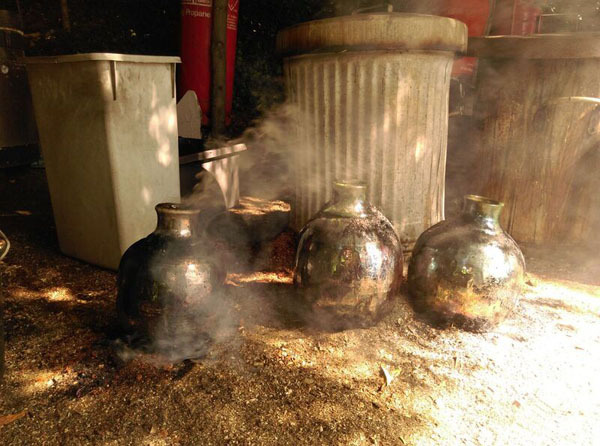 Glazed pots for raku are fired in a kiln made from an oil drum lined with kiln fibre. A gas burner is used for fuel. Unlike the 12 hour glaze firing for my domestic ware; raku pots are put through rapid heating to 1000°C in approximately one hour. This makes the pots very susceptible to cracking due to thermal shock during this type of process and heavily grogged clay is used to try and prevent losses, but they are sometimes inevitable. Once the glaze is sufficiently melted, the pots are removed from the kiln and immediately placed into bins of sawdust. Pots become blackened with soot from the sawdust. This has to be scrubbed off with soapy water and a wire brush before the final results can be revealed. 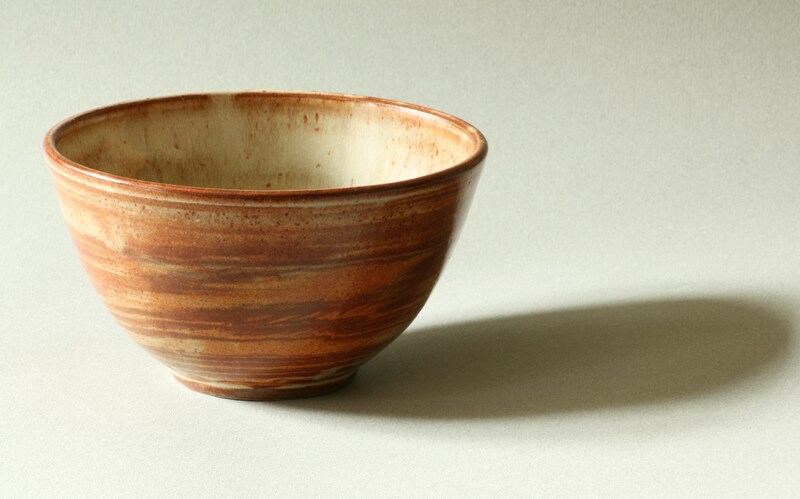 Oxides used in the glaze preparation, such as copper, turn metallic in a reduction atmosphere [created by the sawdust]. The final results are always random, and the amount of lustre and copper flashing is unique to each pot.